Even though I had a wonderful Mother's Day, the weather was anything but wonderful. It was very cold, dreary, and misty. I had planned to wear a colorful, floral outfit on the holiday, but changed my plans when I saw the weather forecast. My daughter was in town for the weekend, and when we were shopping at JCP on Friday, she spotted this cute pleather skirt on clearance for only $14.99 (I actually only paid $10.00 for it because I had a coupon!). I was so happy Ashley was with me this day, because I rarely shop clearance racks (I don't have the patience to sort through them), and I never would have seen this skirt without her. I didn't think I would be able to wear it until fall, but with the cooler weather, I was able to wear it still this spring! It's probably the first time in my life I have ever been happy to have cooler weather! 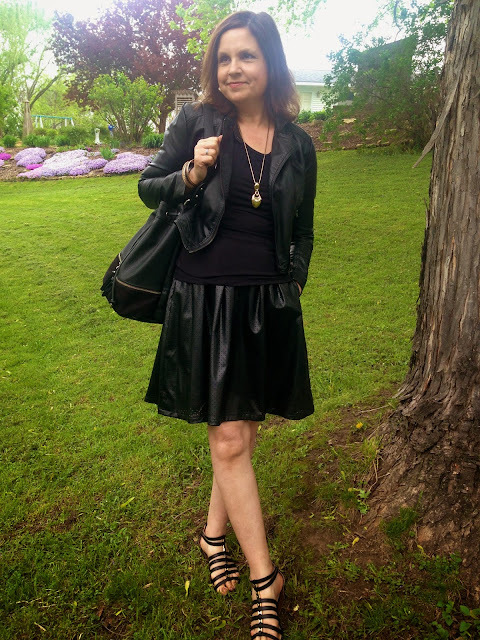 Initially I was going to wear a white button down or a colorful top with this skirt, but I went on Pinterest searching for ideas of how to wear black leather skirts (mine is pleather), and I saw a lot of all black combinations so I gave it a try. I paired my skirt with another JCP find: a short sleeve black knit tee shirt, a black moto jacket (old, Forever 21), and black gladiator sandals (last season, Sears). 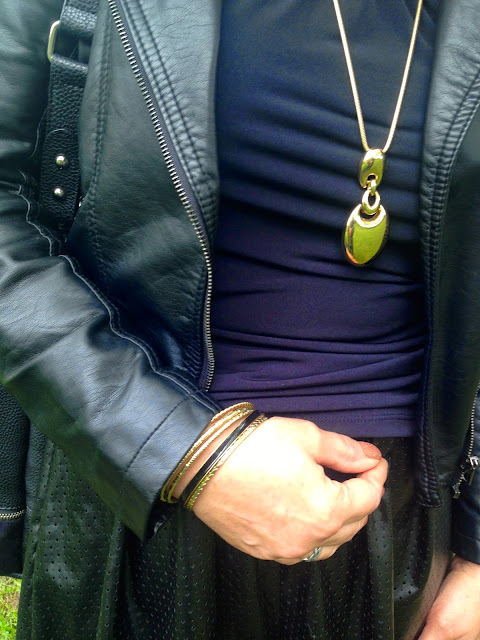 The trick to wearing all black, is to have interesting detail either in the clothing item itself, or the accessories. In my outfit, I did both. 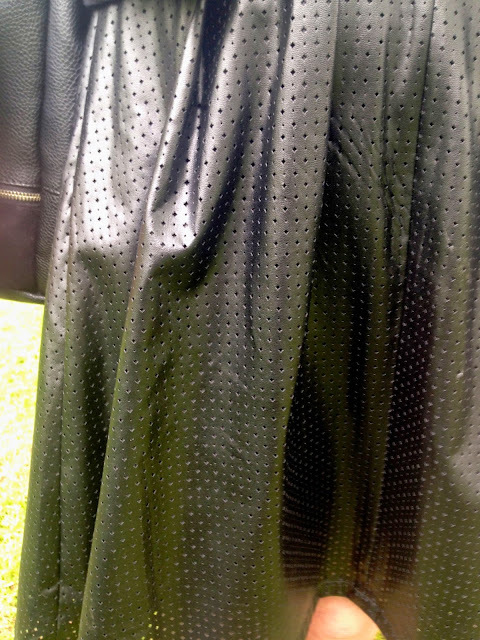 The skirt is pleated and has little holes punched out all over. There is also an exposed back zipper. The texture and interest created by the holes and zipper, keeps the all black outfit from getting boring. Because I had gold accents in my shoes, I accessorized with all gold jewelry by wearing a long gold pendant, gold bracelets, and gold hoop earrings. The jewelry really pops against the black fabric creating interest. 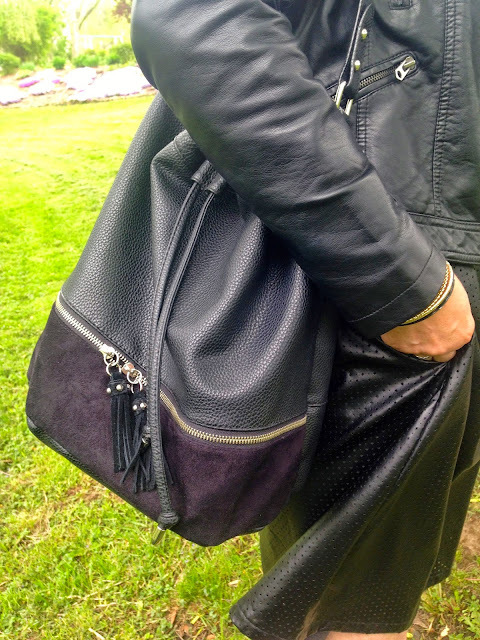 I carried my favorite black bag, my bucket bag by Express, for my handbag. The thin coat was perfect for the day, as I was able to take it on and off at church. I had it off for most of the morning, during worship practice and Christian Education, but when they turned the ceiling fan on right above where I was sitting (ugh! I really don't like it when they do that), the coat when on! I really had fun with my new pleather skirt and wearing all black from head to toe. I don't usually wear all black, in fact, I don't think I have ever worn all black before, so it was a new experience for me. 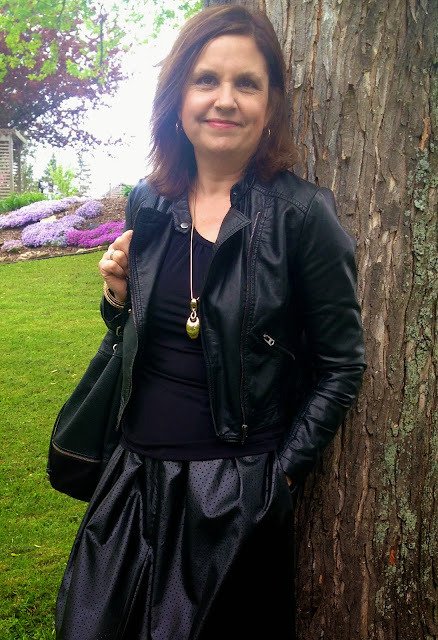 I have since packed away my new skirt in my 'fall closet', as I don't think I will wear it again this season, but I'll be excited to try other ways of wearing this skirt this fall. Keep at least one part of your outfit form fitting so you are not lost in a sea of black fabric. In my outfit, my short sleeve top is very form fitting. Make your outfit interesting by accenting your outfit with a bold necklace. So what about you? What do you think of the all-black trend? Have you ever worn all black from head to toe before other than to a funeral? I'd love to hear from you! 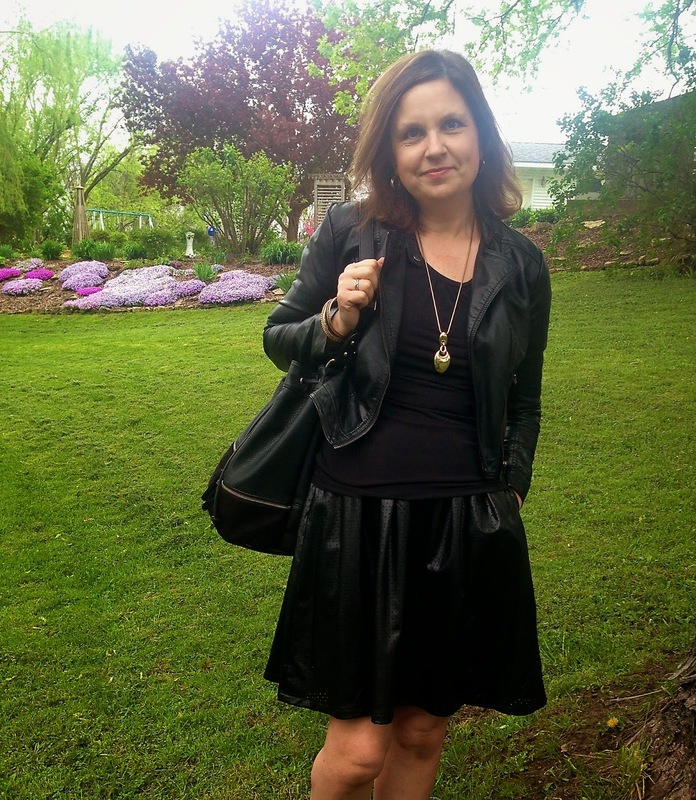 I have worn all black a couple of times but yours looks lovely and definitely edgy for Mother's Day. Cute! I love an all black look! It always feels a little edgy to me. You wear this well. Love the black look and perforated skirt, the bag is so on trend too! Cool look! thanks for linking up to "Bloggers Who Have Inspired Me" yesterday. You look fabulous, Amy! Such a great skirt and for a wonderful price! Gotta love JCP. I really like how you chose to style this look - tres chic! Excellent look and all black my favorite! I always hate admitting that I hate shopping clearance racks, too! That skirt is such a great find, though and I love the detail shot you gave us of it. You look great! Mother's Day should have been rainy here, but somehow we lucked out with some great weather! What a great find on that skirt! The all black gives this outfit a nice edge! Thanks for linking up with Thursday Fashion Files! What a great skirt! Love this edgy outfit. Thank you for joining TBT Fashion link up and hope to see you Thursday.